Andy Ockershausen:	This is Andy Ockershausen, and this is Our Town, and I’m so thrilled to be sitting next to a man who, he’s the best looking man in radio. I used to have that title but I got old. The Love Bug. 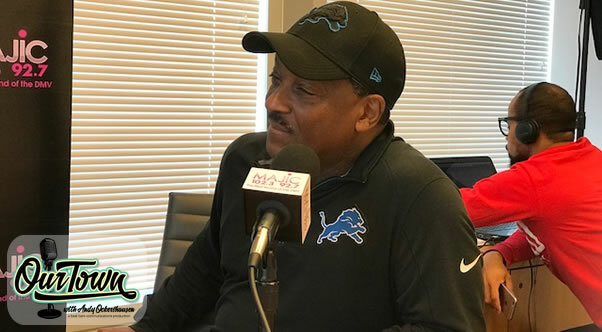 Andy Ockershausen:	Donnie Simpson is one of the most beloved radio personalities in Our Town, and still. We don’t see each other often, but I have the utmost respect for Donnie. He’s a consummate professional. He’s been on top of his game not once, but twice, as a ratings later at WPGC and WMMJ over the past four decades. In addition, he’s been recognized by BillBoard Magazine as one of the best top radio personalities, and the top program director in the Country. It’s been great, Donnie. He’s such an important part of Our Town. It’s a fiercely competitive business radio, and we know that, but Donnie did something in 1985 that touched my heart and touched me completely. You sent two dozen roses to Harden and Weaver on their 25th anniversary, Donnie. Donnie Simpson:	I brought them. I didn’t send them. Donnie Simpson:	I brought them. I left my show and brought them to them. Andy Ockershausen:	Oh, I didn’t know that. Andy Ockershausen:	It’s so classy. Donnie Simpson:	That would’ve been disrespectful to me, to have them delivered. They deserve to have them brought. So, I leave my show to bring them. I mean, that’s the kind of respect I have for those guys. Andy Ockershausen:	Well, you’re so right, Donnie, because those guys worked. Andy Ockershausen:	They worked that job for … They eventually went to 30 years. It’s the same broadcaster. The same time slot. That’ll never happen again, Donnie. Donnie Simpson:	I know. It’s unbelievable what they’ve accomplished. Andy Ockershausen:	But, what you accomplished by doing that, in my eyes, and to the market’s eyes, it was so much good publicity on that. But, you’ve always been a class guy. Donnie Simpson:	And you know Andy, I don’t have to tell you, you know that was not why it was done. It wasn’t done for publicity. Andy Ockershausen:	Oh, I know that. You felt it. Donnie Simpson:	It was strictly out of respect, you know, that’s all it was, out of respect. I have to say this. The same level of respect I had for Harden and Weaver, I have for you. Donnie Simpson:	Really! You are an amazing man to me. I mean, what you accomplished at WMAL was just unprecedented. You guys had a powerhouse going there, and I owe you … I want to say this, too. That I owe you. I thank you for something that you gave me. You don’t even know this, but you gave me, and it was through an article in the Washington Post. It was just a ratings cycle, but you were talking about … You made the point that, you don’t get too up with the ups, or too down with the downs. You stay at an even keel. I’m telling you, for a young guy on the radio at that time, that was such great knowledge for me. It helped me immensely, through the years, and I never forgot that. I always kept an even keel after that. I was like, he’s absolutely right because ratings go up, ratings go down, and you can’t get caught up. Andy Ockershausen:	Absolutely, Donnie. An even keel is what it’s all about. If you stay in the middle, you’re gonna suffer the ups and downs. The same as the economy. Life is like that, ups and downs. Donnie Simpson:	That’s right, that’s right. Absolutely. Andy Ockershausen:	If you’re always steady, you wouldn’t know the good times if you never had the bad times. Donnie Simpson:	That’s so true. Andy Ockershausen:	In broadcasting, people go crazy. They get one book, and I say, one book means nothing. Donnie Simpson:	One book, wow. Andy Ockershausen:	It’s one glimpse of time, Donnie. Donnie Simpson:	Well, I was the same way, and I think some would argue that I took your philosophy to the extreme because I don’t look at ratings at all. Andy Ockershausen:	What a smart man. Donnie Simpson:	I mean, seriously, not at all. I have no idea where the station is, and I haven’t for years. Andy Ockershausen:	God bless you. Donnie Simpson:	I don’t get caught up in that. For me, Andy, I want to do the best show that I can do, every day. If I can be the best that I can be, then that’s all I can do. Andy Ockershausen:	That’s all you can do in life. Donnie Simpson:	If it’s not good enough, then let me know. I’ll take my records and go home. Andy Ockershausen:	Radio is life. You do the best you can. If the audience doesn’t buy it, too bad. I am what I am. Andy Ockershausen:	I’m my own special creation. Andy Ockershausen:	You think that, Donnie, and it works for you. Andy Ockershausen:	You’ve had such a wonderful, wonderful career in radio. Donnie Simpson:	Oh, thank you. Andy Ockershausen:	At Channel 4. Andy Ockershausen:	Those days, Donnie, I can’t believe that. That’s a long time ago. Donnie Simpson:	Oh, it’s a long … That was 1980 when I started doing TV. Andy Ockershausen:	Worked for George. Donnie Simpson:	Yeah, I was George Michael’s backup, the George Michael’s Sports Machine. Andy Ockershausen:	What a special man. Donnie Simpson:	Oh, he was special. Andy Ockershausen:	Haven’t we be fortunate at Our Town to get George Michael, and Jim Vance, and Glen Brenner. Donnie Simpson:	Glen Brenner, oh my goodness. Andy Ockershausen:	What a fortunate time we’ve had, Donnie. Donnie Simpson:	Great, great broadcasters. Andy Ockershausen:	Channel 4 was a powerhouse then, and WRC-AM and FM was … Remember WRC did the Top 40 for a while. Then they did all thing for the FM. They didn’t know what to do with it, so they sold it to Kathy. Andy Ockershausen:	They put them on the map, right? Changed the call letter to KYS. Donnie Simpson:	Well, actually, KYS was changed by NBC because when I was there, it was owned by NBC. Andy Ockershausen:	Oh, I didn’t know that. I thought you worked for Kathy. Donnie Simpson:	Yeah, yeah, yeah. So, those changes, WRC-FM was before I came. When I came, it was KYS. It was Disco93. Andy Ockershausen:	That’s right, Disco. Andy Ockershausen:	I was involved with a man you may remember, Ernie Fears. Donnie Simpson:	I work with his son now, by the way. Andy Ockershausen:	Isn’t that something. Andy Ockershausen:	That’s Ernie the third. Andy Ockershausen:	There’s a fourth running around here somewhere. He worked for me at Channel 50. Andy Ockershausen:	You remember Channel 50, of course. Donnie Simpson:	Of course. I know what you did there too. Andy Ockershausen:	Didn’t you do a show for Channel 50 at one time? Andy Ockershausen:	Never did it? Andy Ockershausen:	But then you got connected with Soul Train. Donnie Simpson:	No, my show was Video Soul. Andy Ockershausen:	Oh, that was your first one? Donnie Simpson:	Yeah, on BET. Soul train was Don Cornelius. Donnie Simpson:	Yeah, Bob Johnson. Andy Ockershausen:	I knew Bob when he had to get a bank loan because he didn’t have any dough. He was really struggling, but he pulled it off, didn’t he? Donnie Simpson:	Well, he got a $60,000 loan and he’s a billionaire now. Andy Ockershausen:	Isn’t that incredible? Donnie Simpson:	So, it worked out. Andy Ockershausen:	But he worked. It didn’t just happen. Donnie Simpson:	Oh yeah. Oh, no, no not at all. Andy Ockershausen:	It didn’t just happen for you. Donnie Simpson:	Yeah, and Bob’s a very dear friend of mine, by the way. Andy Ockershausen:	A very rich, good friend. Donnie Simpson:	Yeah, he is. Andy Ockershausen:	He’s still a good ole guy. When I see him in town, he remembers the days when he was DC Television. He was struggling. He was in the business with us and I remember telling people, Donnie, one time I said, “This cable TV ain’t gonna work. Nobody’s gonna pay.” People aren’t gonna pay. Why would you pay for a baseball game when you can see it for nothing? Andy Ockershausen:	Boy, was I wrong. Donnie Simpson:	Yeah, well. I think we all have those predictions. This is mine. Rap music when it first happened. I was thinking, oh, I’ll give it nine months. Donnie Simpson:	Now, here we are, 35 years later, it’s the hottest selling music in the world. So much, so what do I know? All these people ask me for predictions, I always tell them that. You need to know who you’re asking. I don’t know. Andy Ockershausen:	You already know the answer before you ask the question. Andy Ockershausen:	Do you remember your Detroit days, of course? Donnie Simpson:	Oh, absolutely. I mean, how could you not. I was so lucky, Andy, to get such an early start. I started in radio at 15 years old. Donnie Simpson:	I mean, in Detroit. Detroit, at that time, was the fifth largest market in the country, and here I am. I got a radio show every night from eight to midnight. I was so young, I couldn’t even do my show live, the whole show live, because I couldn’t work past 10:30. So, after school, I used to have to go into the station, record my last hour and a half. Go home. Do my homework. Have dinner. Then, I would go do the show live from 8-10:30, put on a tape, and leave. Andy Ockershausen:	You worked at it. You worked and you worked. Did you know another one of your contemporaries, Paul Berry, is from Detroit? Donnie Simpson:	Oh, yeah. Absolutely. Andy Ockershausen:	Did you know that? Donnie Simpson:	Oh yeah, of course. Andy Ockershausen:	Of course, you did. I mean, what he went through to get his start in radio. He’s a radio guy then he switched to TV. Andy Ockershausen:	Alright. We’re talking to Donnie Simpson. We’re gonna take quick break, and we’ll be right back. This is Our Town with Andy Ockershausen. [GEICO Commercial]On-Air Announcer: You’re listening to “Love Advice” with Leanne. Caller, you’re on the air. Carl: Hi, Leanne. Long time listener, first time caller. Why, in your professional opinion, do you never take my calls off the air? On-Air Announcer: Is this Carl? Carl: Yep, it’s Carl. I mean, we had a few dates, everything was great, I thought. On-Air Announcer: Well, you know when you switch to GEICO, you could save a lot of money on car insurance. On-Air Announcer: You should call them. Announcer: You’re listening to Our Town. Andy Ockershausen:	This is Our Town. Our guest today is Donnie Simpson. Andy Ockershausen:	Well, you’re a radio guy that made a gold mine in TV. You’ve been so successful, Donnie. Andy Ockershausen:	Ole Green Eyes, I love it. Andy Ockershausen:	That fit you, Donnie. Donnie Simpson:	Yeah, that was the Love Bug in Detroit. Well, here’s one that people don’t know. Well, some Detroiters would know, but before the Love Bug, I was Devastating Don. Donnie Simpson:	Until I learned what the word, devastating meant. I didn’t even know. It just sounded cool. It’s like, then I began to say, you know what, I’m like Michael Jackson. I’m a lover, not a fighter, so I changed it to the Love Bug. Andy Ockershausen:	Well, what you have done for Our Town has been so spectacular because you brought all that talent to Washington. You just didn’t leave it up there in Motown. Donnie Simpson:	Oh, well, thank you, Andy. I tell you what this city did for me was far more significant than what I did for it. This city has been good to me. Andy Ockershausen:	But, it always comes back, Donnie. When you give, it comes back in so many ways, does it not? Donnie Simpson:	Yeah, we found out. It does. Andy Ockershausen:	All the charity work you’ve done all these years, and growing up in Our Town, I’ve been fortunate enough to see it from both sides. I’ve been management. I’ve been talent. Such as it was, I had my own show on Channel 50. It was a flop, but nobody knew it because they didn’t see it. Donnie Simpson:	We all have those. Andy Ockershausen:	We know what they are. Donnie Simpson:	My first TV show was in Detroit, actually. I was 17 or 18, my first TV show. Donnie Simpson:	I can’t even remember the name of it, but it was a dance show, and it was so bad my mama didn’t even watch. Donnie Simpson:	It was awful. Terrible. I would love to have video of that, though. I would love … You know, I should put that out there on social media. Maybe somebody would have it, somehow. Andy Ockershausen:	It would have had to be wire recording. It was a long time ago. Donnie Simpson:	It was a long time ago. Yeah, that was … That had to be 1971. Andy Ockershausen:	That’s probably the beginning of tape coming alive then, right? Donnie Simpson:	Yeah. It was before Betamax. Andy Ockershausen:	It was cine-recording of some kind, right? Andy Ockershausen:	Donnie, you know, talking about local people and local things in Our Town, there’s a story that I like to tell about a man I met, named Conyers, from Michigan, a congressman. Andy Ockershausen:	I met him through … He’s been in the news now, and I feel so bad for the guy because nobody knows what goes on in the world. He was a big admirer of our Felix Grant. The guy that did … before he was number one in jazz, John Conyers called me and asked that he’d like to meet Felix Grant. Andy Ockershausen:	So, I took him to lunch with him over on Capitol Hill, and he came up and sat in the show with him a few nights. What a delightful, wonderful man. Donnie Simpson:	Yeah, oh yeah. Andy Ockershausen:	John Conyers was a great, great citizen. He still is, for my money. Donnie Simpson:	He still is, yeah. Andy Ockershausen:	He’s a radio fan and he knew it. He knew jazz much more than I would ever intend to know, but if it weren’t in Our Town, where else could that happen, where a congressman can call you and ask you for permission to come up and meet Felix Grant. Donnie Simpson:	Isn’t that amazing? That’s amazing. Andy Ockershausen:	But a class guy, all the way. Whatever his problems are or aren’t, he’s still a very, very, very important part of Our Town, and he is to me. Donnie Simpson:	Oh, without a doubt, and to me. He still is an icon. Andy Ockershausen:	He spoke at Felix’s funeral. Donnie Simpson:	Oh, did he? Andy Ockershausen:	Yes. He was one of the people that was so important and knew Felix from his days when I introduced them. Donnie Simpson:	But, he was also instrumental in getting Dr. King’s birthday recognized as a national holiday. Andy Ockershausen:	He did so much, did he not? Donnie Simpson:	Yeah, without a doubt. Andy Ockershausen:	He did it with so much class. Now, see, you have the same class. You’re in a city, the capital of the world, and these people are your fans. Andy Ockershausen:	I read about Obama sending you the congratulatory telegram. Donnie Simpson:	Yeah, right, right. Andy Ockershausen:	Where else could that happen, Donnie? Donnie Simpson:	Oh, I know. I know. It’s D.C. For me, early on, too, was kind of cool because I grew up in Detroit. Home of Motown. So, I can remember, man, I was on the air when I was 16-17 years old, and I would play a set of Stevie songs, three or four Stevie songs, or Smokey songs, and they would call. They would call. They didn’t have a hotline number. They’d call the request line. You know, “Man, I was just listening and heard you play … ” and I’d put them on the air and we’d talk. Eddie Kendricks from the Temptations used to come down and hang out with me on my show. He wasn’t even on air. He would just come down. Sit there. He’d bring a six-pack of beer. I couldn’t drink. I was too young. He’d sit there for two and a half hours while I’m doing my show. I’m hanging out with one of the Temptations. Andy Ockershausen:	That’s a great story, great, great story. Donnie Simpson:	It was amazing to me, especially because I was such a Motown fan. Andy Ockershausen:	And, you’re just a kid. Donnie Simpson:	I was just a kid, and I used to go to the Motown reviews. I used to watch every Cadillac that went by, hoping to see Smokey or one of the Temptations, or one of their cousins. That would’ve been fine, too. Andy Ockershausen:	Just whoever’s driving the big car. Andy Ockershausen:	Donnie Simpson, you are an incredible man. Donnie Simpson:	Oh, thank you, Andy. Andy Ockershausen: Donnie, one of the startling facts about your career is you took a hiatus, and it didn’t affect your popularity at all. It was amazing. You took off in 2010. Donnie Simpson:	Yeah, well actually, it increased the popularity, in my opinion. Honestly, it really has. I had this conversation, and I don’t mean it to sound like I’m name dropping, but with Sugar Ray Leonard, who’s a very, very dear friend of mine. Donnie Simpson:	Has been for 40 years. Andy Ockershausen:	And Charlie Brotman. They come as an entry, almost. Donnie Simpson:	Yeah, right, right. But, Ray and I were talking about, just, you know, he took off for five years and when he came back to fight Hagler, he said … He was always popular, but it took it to a different level, that time off. He said, “You know what it is, Donnie, is that this thing that you like is gone, and you think there’s going to be no more, and then suddenly, it comes back to you and people appreciate it that much more.” I saw that. Andy Ockershausen:	Oh, that’s a great parable. Donnie Simpson:	I’ve seen that with my return. It’s been amazing. I left because after, wow, I’d done radio at that point for almost 40 years, and it was 39 years of all the fun I could stand, and last year I hated it. I actually just hated doing radio. Andy Ockershausen:	You got fed up. Donnie Simpson:	Yeah. Well, they were, for the time, trying to tell me what to do, and I wasn’t used to that. Andy Ockershausen:	Ah, ha. New owners. Donnie Simpson:	Yeah, well, no. They had been in place for a while. I’d been with them for two contracts, so probably eight or nine years, but, well, it was a new rating system. Andy Ockershausen:	Ah, ha. We’re going to live by the ratings. Live by the ratings, die by the ratings. Donnie Simpson:	Right, exactly. Exactly, and so I used to tell everyone that I couldn’t wait for Monday morning at six. That year, I couldn’t wait for Friday morning at ten. Couldn’t wait. I just hated it, and so I said, you know what? I’m done. I’m this way Andy. I’m a very simple man. I have to be happy and if I’m not happy, I’m gonna do something else. No job is worth me being unhappy for. I’m extremely blessed because I understand that there are a lot of people that get stuck in those situations because they have to. They have no choice. They have to work, have to provide for their families, and stuff like that, so they deal with stuff that they don’t really want to deal with. I was so blessed to be in a position where I didn’t have to, and I didn’t. I set out for five and half years, man, and I’m telling you, I enjoyed it. I did not miss radio. I did miss my listeners. Andy Ockershausen:	You miss the people that count on you. Donnie Simpson:	Yeah, I did miss them. The only times I missed the show, the day Mayor Barry died, and the day Chuck Brown died. Donnie Simpson:	I wished I were on the air to honor them. Donnie Simpson:	Other than that, I didn’t miss it at all. I was running a transportation service during that time. I was transporting grand-babies back and forth to school, and I was good at it, Andy. I loved it. Andy Ockershausen:	I’ll bet. When you lose the spirit of what you had, you’ve lost the interest and the fun, you got to get out. Donnie Simpson:	You got to get out. Andy Ockershausen:	Why then, come back? Did they pursue you? Donnie Simpson:	Well, I got a call. At first, I really wasn’t interested in doing that, but after consulting with some people … Actually, it really came down to my wife. Andy Ockershausen:	I didn’t marry you for lunch. Donnie Simpson:	Right. That’s so funny. I didn’t marry you for lunch. So, you know, I could take a good hint. But to hear my wife say that, but you know, first of all, I’m shocked that this is my wife saying this. I didn’t know that she thought I had any talent. But, you know, I listened to it and I decided, you know what? She’s right, man. You need to do this, and I’m so glad I did. It’s been amazing. Donnie Simpson:	You know what, me and my wife have been married for 44 years, now. Andy Ockershausen:	Isn’t that wonderful? Donnie Simpson:	But we had some times, too. You know, we all do. Donnie Simpson:	But man, I got to tell you this, Andy, that it is the greatest joy of my life is to see my high school sweetheart, now in the role of grandmother. Andy Ockershausen:	Oh my gosh. Donnie Simpson:	That’s so cool to me. To have seen that much of someone’s life. To have shared her life, that much of a person’s life, is just amazing to me. Donnie Simpson:	Well, we’ve been boyfriend and girlfriend for 47, but married for 44. Andy Ockershausen:	Oh. Same school in Detroit? Donnie Simpson:	No, she went to a different high school. She went to high school with my twin brother, as a matter of fact. Andy Ockershausen:	That’s a good place to take a break. We’ll come back and here more about that. This is Andy Ockershausen in Our Town, talking to Donnie Simpson. [Begin Commercials] Mike Collins: Maybe your kids are about to graduate from college or even get their graduate degree. Or, you’re looking forward to retirement finally. Don’t go another day without getting your legal house in order. This is Attorney Mike Collins. Let me show you how to get a basic estate plan in place that will protect you and your loved ones in the years ahead with our trademarked Reservoir Trust. All I ask is two hours of your time. Check the mail for your special invitation and register now at mikecollins.com. I’ll even waive the tuition. That’s mikecollins.com. Hi, Tony Cibel here to tell you about Tony & Joe’s and Nick’s Riverside Grill at Washington Harbor in Georgetown. Spectacular new restaurants. We’ve spent a lot of time rebuilding. You’ll love it. It’s really fantastic. For any information you can go online to tonyandjoes.com. It’ll be a wonderful experience for the whole family. Call 202-944-4545 to make reservations. Announcer: You’re listening to Our Town with Andy Ockershausen. Brought to you by Best Bark Communications. Andy Ockershausen:	We’re with Donnie Simpson, and this is something I didn’t know. You have a twin brother? Andy Ockershausen:	How come I’ve never read or heard that before? Is he in the industry at all? Donnie Simpson:	No, no, no, no, he’s not. Donnie Simpson:	He’s straight, right. Yeah. As a matter of fact, I have my oldest brother, we look more like twins than me and my twin brother. Andy Ockershausen:	Is that right? Donnie Simpson:	Yeah, it’s really strange, but that guy is my heart, man. I love him to death. Andy Ockershausen:	And all of your brothers are still alive, of course? Donnie Simpson:	No, we lost one. My second oldest brother, Harry. And a fascinating story, if you’ve got a second, I’d love to tell you about it. Andy Ockershausen:	Oh, we want to hear it. Donnie Simpson:	Yeah, Harry was the classic Vietnam case. You know, came back from Vietnam a decorated war hero, addicted to heroin. He was strung out. Harry was a street junkie. Andy Ockershausen:	A lot of guys can’t make it without heroin. Andy Ockershausen:	In the military. Donnie Simpson:	There were so many years where we thought, you know, we were just waiting for a phone call to come identify this body, but finally, after 15 years or so of him being sick and tired of being sick and tired, he finally went through a rehab that worked. Got him back, and Harry went to school, to college, and he was too upset, because in four years, he got one B, right? He was always brilliant. He had just used it for his hustle, before. Andy Ockershausen:	What’d you say? I’ll take the B.
Donnie Simpson:	Yeah, right. But, he went on to start his own drug rehabilitation center. Donnie Simpson:	He started the Needles Exchange program in Michigan. He went on to consult doctors and HIV/AIDS prevention across the state of Michigan. Donnie Simpson:	He eventually crossed the Country. He came here to the Capitol to meet with President Clinton to talk about his programs. I was so proud of him, but, he relapsed 30 years later, which shows you how strong that thing is. Andy Ockershausen:	Once it gets ahold of you, you never can tell. Donnie Simpson:	Right, and he was gone a year later. You know, I choose to … I wanted to mention it because, you know, I honor him. Donnie Simpson:	I think it’s quite a story. I look at it like this, Andy, that because of his experiences, he was able to go in and help people that I never could have helped. Andy Ockershausen:	He’d been there. Donnie Simpson:	I wouldn’t have known where to go. He’d been there, right. He knew these streets, you know? Andy Ockershausen:	That’s so great. Donnie Simpson:	So, I feel like, maybe that’s why God had him in that situation. Donnie Simpson:	To help people. Andy Ockershausen:	Mission. You never can tell. Donnie Simpson:	Yeah, right. So, his name was Harry Simpson, by the way. Andy Ockershausen:	Harry Simpson. Hey, is he related to any of the Simpsons? No, you’re not related. Any of the TV stars? Donnie Simpson:	No, Bart and … No. Andy Ockershausen:	The ones with the money. Andy Ockershausen:	We went through it in Our Town with Jim Vance, when he went to the clinic out in California. It saved his life and then from then on, he was just wonderful Jim Vance. Andy Ockershausen:	There will never be another one in Our Town. Donnie Simpson:	Oh, Jim was the best, man. I can not tell you how much I miss that man. I loved Jim so much. Andy Ockershausen:	He felt that way about you. It was so evident. Donnie Simpson:	I know. I know that. Andy Ockershausen:	You know it. Donnie Simpson:	I can say that with certainty. Andy Ockershausen:	He didn’t hide it, did he? Andy Ockershausen:	He wore it right here, baby. Andy Ockershausen:	That’s right. You do it too, Donnie. Donnie Simpson:	You know, there’s another reason I miss him, is because of this Andy, and I’m sure you can appreciate this. As your career grows, you get to a point where there’s only a few people that can relate to the issues that you’re having. If you’re making a certain amount of money and you’re complaining of it, some people can’t understand. This is all he wanted. This is not a lot of money. It would sound … Jim was the guy that I could talk to about that. Andy Ockershausen:	All the time. Donnie Simpson:	He understood. I don’t mean that to just say it was about money, because it was much more than that. I talked to Jim, three times, the day before my hiatus. Andy Ockershausen:	He could relate to you, right? Donnie Simpson:	And what I wanted to do, but I needed Jim’s mind. I wanted to know what he thought about it, and he was with me 100%. The night I retire, that night on the news, the reporter filed a report and Jim came behind him and said something I will never forget. He said, “They wanted Donnie to change. Donnie wouldn’t change because Donnie couldn’t change.” It was so deep. Andy Ockershausen:	Oh, my God, to say that. That’s incredible. Donnie Simpson:	Yeah, and it was deeper than some … and I said this at his memorial service. That statement may lead some to believe that this is some old guy stuck in his way, unwilling to change. No, Jim understood what it meant. It meant that I couldn’t change because this is who I am. You’re asking me to do your version of Donnie Simpson. That’s never gonna happen. Andy Ockershausen:	It doesn’t exist. Andy Ockershausen:	You are what you are. Donnie Simpson:	I am who I am. Period. That’s all I’m ever gonna give you. If that’s not good enough, then that’s fine. Let me know. Like I said earlier, I’ll take my records and go home. I’m done. I’m fine. Andy Ockershausen:	Well, you didn’t go home. You took a rest. They call that a broadcast hiatus, but you came back. Donnie Simpson:	I thought I was retiring. It wasn’t a hiatus. Andy Ockershausen:	People wouldn’t let you retire. Donnie Simpson:	No, they wouldn’t. Andy Ockershausen:	Your wife wouldn’t let you retire. “I’m tired of you hanging around the house.” She’s our biggest friend. Andy Ockershausen:	We’re having a party for him. Don’t let him come back. Andy Ockershausen:	Donnie Simpson, you’re one in a million. Thank you, thank you, thank you so much. Donnie Simpson:	Oh, thank you, Andy. Thank you. Andy Ockershausen:	You’re a busy man, but maybe it won’t . . . , but I’m here for you 24/7. Donnie Simpson:	Thank you, man. Andy Ockershausen:	I do know some things, Donnie. Donnie Simpson:	You know a lot of things, Andy. It’s an honor to be on your show. Andy Ockershausen:	You are a special guy. Andy Ockershausen:	Our Town loves you. I love you. Donnie Simpson:	Well, thank you. I love you, too. God bless you. Thank you. Announcer:	You’ve been listening to Our Town, Season 3, presented by GEICO, our hometown favorite, with your host Andy Ockershausen. New Our Town episodes are released each Tuesday and Thursday. Drop us a line with your comments or suggestions. See us on Facebook or visit our website at ourtowndc.com. Our special thanks to Ken Hunter, our technical director, and WMAL radio in Washington D.C. for hosting our podcast, and thanks to GEICO. 15 minutes can save you 15% or more on car insurance. ©2016 - 2019 · Our Town · All Rights Reserved.